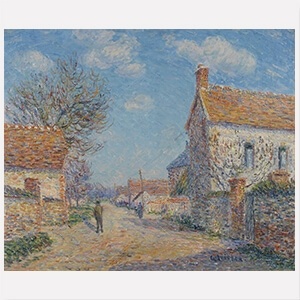 Gustave Loiseau was born in Paris in 1865 and trained as a decorator, before attending the École des Art Decoratifs and studying with landscape painter Fernand Just Quignon. In 1889 he moved to the artist colony Pont-Aven on the French Atlantic Coast, where he befriended Maxime Maufra and Henri Moret and in 1894 met Paul Gauguin. Loiseau first exhibited his work at the Salon des Indépendants in 1893 and later at Salon d’Automne. After 1895 he was represented by Parisian art dealer Durand-Ruel. Loiseau is best known for his landscape paintings, especially of the Brittany and Nomandy coast the and the Seine valley. Initially an Impressionist, his later paintings show a more controlled brushwork and subdued palette. Later in his career, he also became interested in still-lifes. He died in Paris in 1935.